Shawn Hargreaves of the XNA Team, has posted an excellent item explaining XNA’s Model class hierarchy. If you see one blog post this year, see “Models, Meshes, parts, and bones”. Honestly, this is a good read folks, and rather entertaining too. Clearly Shawn was having a great day when he posted it. 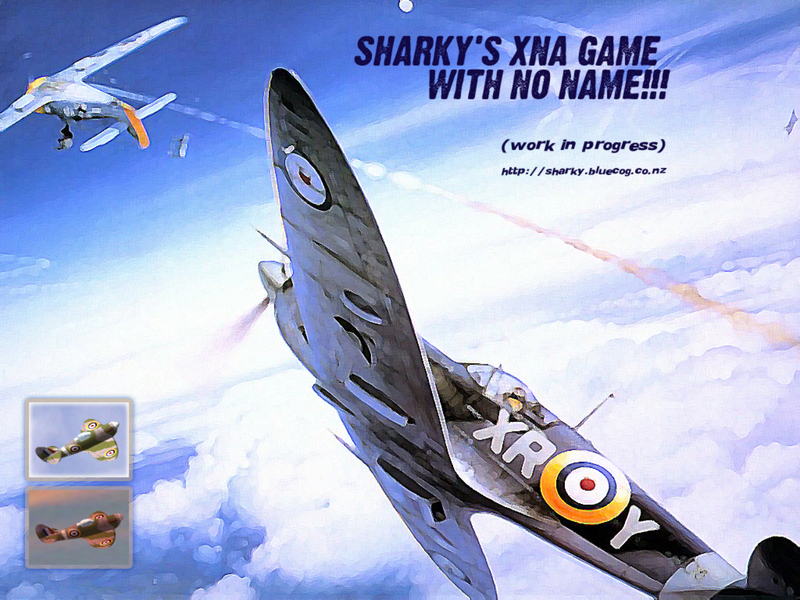 Another new release of the XNA game "Sharky’s Air Legends" – now you can change speed! I’ve just uploaded another release on the Latest Builds page. So go grab it and give it a whirl. I’d love to know what you think. I have added a throttle control so now you can vary the speed of the Spitty! To go faster use the XBOX 360 Controller’s RightTrigger. For Keyboard users use any of the following Keys: Left Shift, Left Ctrl, Left Alt or Right Alt. Whichever you prefer but I think Right Alt is the most intuitive. Fixed the problem I blogged about earlier. Playing for long periods could result in the background going black and hideous framerates. The code was carelessly consuming too much memory and eventually resulting in the problems. I’m now much more careful about freeing up memory I’ve used, so the memory usage doesn’t climb nearly so high. Improved the AI. I had inadvertently ruined it in the previous release. Oops, sorry. The Title screen/menu is a little more original than it was before. I’ve been feeling guilty about my use of the well known painting, so I’m gradually making a parody of it instead. It now features my own Spitfire model posed to match the painting. Not as pretty, but at least it’s my own…well mostly – parts of the original painting are still visible. Updated: my spelling was awful. You may or may not have noticed already, but my last build (10 November 2006) doesn’t run too well over long periods of time. I’ve noticed that if I play it for reasonable length of time (at least a couple of minutes perhaps), the sky suddenly goes black, and the framerate gets horrid. Not really sure of the cause yet. Possibly a memory leak, or maybe not recovering from a DeviceReset cleanly. Just letting you know that I’m aware of it - looking into it - and hopefully fixing it. "Sharky’s Air Legends", the working title. Well, I guess it’s official. 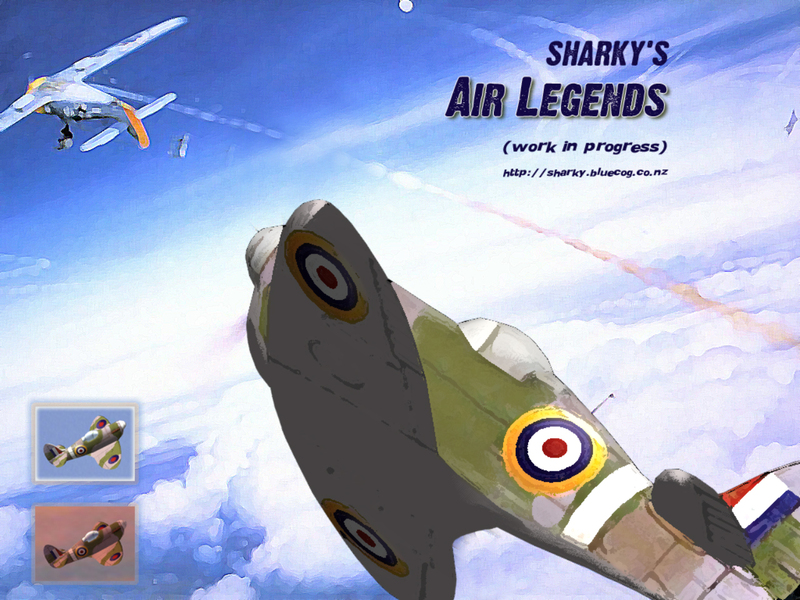 “Sharky’s Air Legends” is the *working-title* for my game in progress. As with the game itself, the title just evolved. It came about when Microsoft needed some kind of title for featuring in their XNA showcase video, and was actually one of their suggestions (the game’s filename was “Legends.exe”). Has a nice enough ring to it, so I just went with it. Obviously, if I ever went commercial with the game, I’d have to think up something less “homebrew” feeling. It’s not like the namesake was ever an Ace fighter pilot, now was I? Whatever happens, I think the “Legends” part of the title would probably stick. Part of my motivation to create yet-another-WWII-game is because there really is so much WWII lore left to tell. The long-term goal of my game would be to let the player easily experience these legendary aircraft in scenarios typical of what they fought in. Lancaster Bombers: Dambusters, bombing the Tirpitz. AWESOME, that’s what I’m talk’n about right there! Tribute to the XNA team. Thanks. You ROCK! So, I said earlier I’d talk about the XNA team and their excellent support as I worked on the XNA beta 2 conversion of my game. prompt, enthusiastic & great communicators. superb ambassadors for not just XNA, but Microsoft too. I’m not just talking about them individually either. It really felt like the whole team was pitching in to help. I was never treated like an idiot (even though I knew I was). And there was not a single complaint about the amount of emails I was spamming their way. New XNA game build released. Now converted to XNA beta 2. Phew! It’s been quite a ride, but I have finally finished converting the game over to XNA beta 2. Go get the new build at my latest build page. The initial code conversion went fairly smoothly – until I tried running it. There must have been enough subtle changes to XNA under the hood that my game simply didn’t render like it used to. Basically naive code assumptions on my part, that by some fluke worked under beta 1.
and to top it all off, my 3D model was rendering very strangely indeed. Even had Mickey Mouse ears at one point. Sorted now – my bad. So, all issues are ironed out, and such a relief! I really couldn’t have done it without the most excellent support of Microsoft’s XNA Team. I will blog about them real soon. Especially for JD, I will try to reduce the number of Exclamation marks & capitalised words placed in this post. Microsoft have produced an impressive wee video showing off some of the cool stuff people are doing with XNA. So if you thought my game was a little perty, just wait till you see some of the other stuff folk have been doing. Truely stunning. David Weller of LetsKillDave has the sweet details here. p.s. a higher resolution video will follow, but for now it’s a fairly small “Zune” sized one. Game Studio Express Beta 2 IS OUT NOW!!! True to form LetsKillDave had the BIG news first! You can read about and get Game Studio Express Beta 2 from this page. Here’s the direct download link for the impatient. In other good news I see the page also has a download for the XNA framework redistributable. This is what people will need in order to play our games. At last, they won’t be forced to install the whole development suite just to play the game!!! Mitch Walker of the XNA Team has posted more details on the changes between Beta 1 and Beta 2. Check it out here. So much to do – so little time. You are currently browsing the Sharky's Blog weblog archives for November, 2006.